But then, this afternoon, the story took a turn for the terrifying when it became clhe hacker gained such broad access to Vtech’s servers that he also downloaded about 190-gigabytes of photos from the company’s Kid Connect service. This is a simple little app that lets parents chat with their kid using a Vtech tablet and a smartphone. The images themselves appear to be headshots that Vtech encourages its users to upload when using the app. In a sense, the hack is comparable to someone breaking into Facebook and making off with all of your private information and photos. The major difference, of course, is that we’re talking about a company that makes devices for small children. The wifi-connected Vtech tablets are recommended for children between the ages of three and nine. Vtech also makes a digital camera and a camera-mounted smartwatch for the same age range. It’s certainly not the kids’ fault that a random hacker can see what they’re doing with their toys. For example, there is no SSL anywhere. All communications are over unencrypted connections including when passwords, parent’s details and sensitive information about kids is transmitted. These days, we’re well beyond the point of arguing this is ok – it’s not. Those passwords will match many of the parent’s other accounts and they deserve to be properly protected in transit. You’d think if you were a children’s toy company hosting photos and addresses of small children on your server you’d at least encrypt the connections. The Vtech hacker says he used an old school SQL injection to break in and get root access to the company’s servers. “It was pretty easy to dump, so someone with darker motives could easily get it,” he told Motherboard. For what it’s worth, the hacker says he doesn’t plan on publishing the data publicly. It’s hard to decide if you want to be horrified or downright angry about this situation. On one had, the Sony hack and Target breaches have shown that anyone can be an unwitting victim to a company’s weak security. However, the especially terrible security at Vtech makes you wonder if you should even be letting kids play with internet-connected toys. After all, it was just a few months ago that we learned how the new “Smart Barbie” could spy on kids. What else can go wrong? I don’t have kids, so my opinion on this matter is somewhat uninformed. I do remember that my first favorite toy was Socrates, an educational robot made by—guess who—Vtech. Who knows what I typed into that little grey box of fun. If my parents ever had half of a suspicion that some pervert could gain access to my toy and watch me play, well, it probably would’ve been back to a Lego-only playtime for me. Now, in 2015, this is a very real possibility. 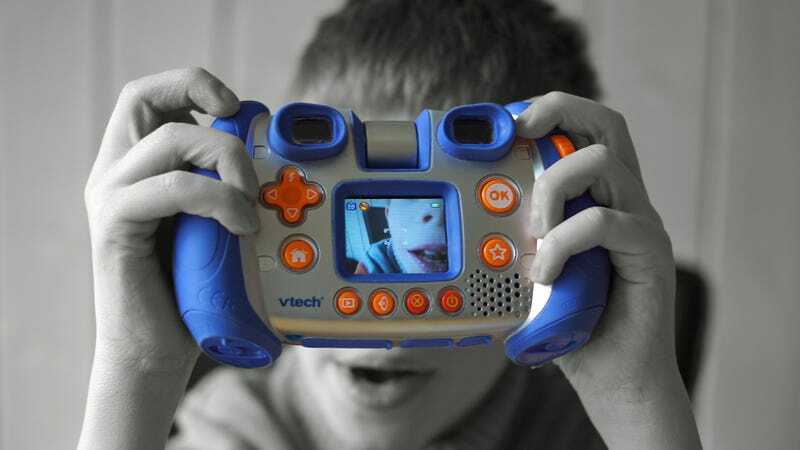 Say what you will about connected toys and cheap electronics for kids, but this Vtech bonanza should serve as a wakeup call to any and every company cutting corners on security. It should also be a weighty reminder to parents who would buy these devices that companies do cut corners on security. This not only puts their personal data at risk. Neglect puts kids at risk, too. In total 4,854,209 customer (parent) accounts and 6,368,509 related kid profiles worldwide are affected, which includes approximately 1.2 million Kid Connect parent accounts. In addition, there are 235,708 parent and 227,705 kids accounts in PlanetVTech. Kid profiles unlike account profiles only include name, gender and birthdate.